Here is a guide to why no one has any real control over the broad band performance they get but also a little tale of how we doubled the broadband and wireless performance at one site. When it comes to broadband you get what you are given. Everyone is offered the service of zillions of Gigabytes for a few pence per week but reality really delivers. Its also difficult to squeeze any significant extra performance, even if you follow some of the websites. It’s a bit like the myth of £200 Goldplated HDMI leads, they don’t work any better than a £2.50 cable, ask my why and I will tell you. 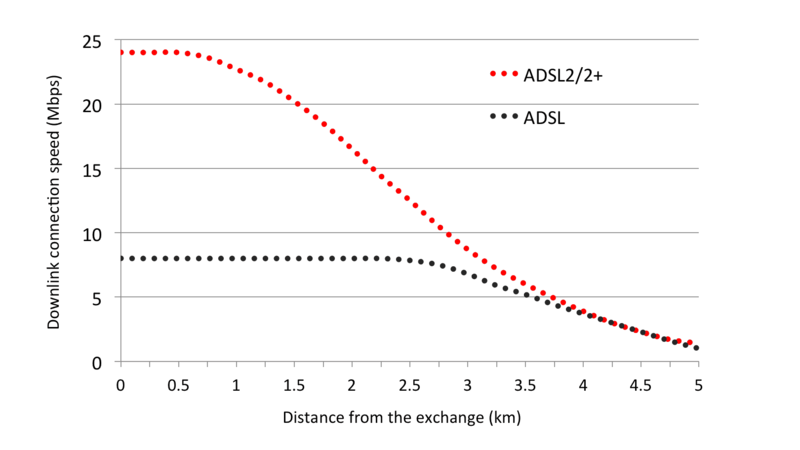 The further away from the excjhange then the slower the broadband will be, have a graph. So if you leive near the exchange, which can anything from a large brick building with Openreach vans to a small brick building tucked away in larger villages You will get a good fast broodband signal. You can see how fast it tails off and at around 3km its getting bad. Remember it’s not how the bird flies but how far the cable travels. In the case we are quoting later the crow would fly 3 km but the cable snakes a 6.2km route to the property and through some pretty ropey cables and connectors. Sp distance is a factor, If I am sitting nect to you and you shout my name its easy to hear but the further away I go then the fainter your shout, so that is signal strength. The other factor is signal to noise ratio. If my ear is 2cm from your mouth then I will hear your shout quite well. If I move across a crowded bar ten metres away, then I would be pretty pushed to hear you over the heavy metal music that happen to be playing, so you slow down what you are saying, it’s the Englishman talking to a foreigner effect. Whereas in a wood at night no problem. This is the signal to noise ratio, no noise the ratio is high, loads of noise it gets quite low. This is measured in dB or decibels, the figures are confusing so we wont really go there. So the stronger the signal and the lower the noise the better and clearer what comes out, in Broadband terms, the faster the signals, notice the plural? There are two types of signal, Upstream and Downstream. The down stream is what the exchange sends to you, upstream is what you send to the exchange. They work at different speeds because you send “I want Google” by typing it in, you type the URL http://google.co.uk, 19 charcters and you get back a a screenfull for example Wikipedia is over 28,000 and google is about 2000, BBC news is around 3,000. From this you can see that you want to send less than you get back. There are exceptions which I will talk about later. As a result the download speed is more than the upload speed and as nearly all lines go through BT they dont give you any more upload speed than they have to. How does this all get sorted out for my home speed? Your router “talks” to the exchange, they hold a “Can you her me and how well?” conversation. They start high and gradually drop the speed until the signal is clear between them, this can take ten days and is known as the training period. One of the measures is the Signal to Noise Ratio, I mentioned this earlier with the crowded room. BT sets a limit of 6dB, TalkTalk run a little higher at 9dB. It doesn’t matter the method but when the router reports the SNR ratio as 6dB back to the exchange the speed change stops and that’s what you get, and the higher the down speed the higher the up speed. The chances are that if you get 2Mbps down you will get 0.5Mbps up. If its 1Mbps then you will get 0.256Mbps. Don’t worry about the units its about how many characters per second you get. As you have guessed by now, if you have been following the blog, we are geeks, but we are unusal in that we can explain things in English. We know that ALL routers run on UNIX. This is a system that has been about for years and virtually runs the Internet, all Apple products, Android phones and probably your TV but most medium to small IT companies avoid it because it’s too technical for them. So we take a router, reprogram it so that when it sees a poor signal at 12dB it doesn’t tell the exchange that figure it says, yep 6dB all is well, the exchange being trusting says ” OK time to fix the speed” and sends it faster than it would do otherwise. The risk is that the signal will get swamped and drop out, only it doesn’t. We have been able to take a broadband router with a speed of 1.25/0.256 Mbps and get the speed up to 2.6/448 Mbps which makes Youtube and iPlayer work at HD resolution with any buffering or delays. You can’t do this to any router, you need one that has ADSL configuration and allows you to change the programming. We found one at around £200. And there was an added bonus. In Ameraic everything is bigger, houses, ranches, everything so If you have a big house and a large “yard” or garden to us Brits you need a good signal from your wireless broadband. In Europe apparently we all sit in each others lap sowe can have less signal, according to Brussels EU-Rule 2005/513/EC. limits the output power to 100 mW but US routers go up to 400mW which gives you a better range. There have been experiments that have upped the power to 1,500,000mW and achieved a 50Km wirelsss signal. So we just told the router it was now in the US of A and we wanted 100% power and it then covered an area of 2 acres rather than three rooms. We haven’t tried it any further but we have removed two repeaters. While we are on the subject of wireless different devices work differently. Normal laptops have a small aerial the size of a 1p. We like the T series of Lenovo they are built the way a laptop should be built, with the best that technology can offer. For example the T series have twin aerials running down each side of the screen, That’s why the work better and cost more. Also on that topic we setup a small experiment at a marina, we took a small UNIX computer called a Raspberry pie, attached a decent aerial and a wireless device and we were able to get a signal that phones and laptops couldn’t get. We then took this signal and re-broadcast it so that every device on the boat, phones, laptops etc. could have broadband even though the marine had limited to one single device per boat. We could have over 200 sharing the signal. There are marine devices to do this for around £700, we reckon we could supply the same thing for £200-£350. Interested? works for caravans and anywhere where there is a week WiFi and limited to one device. This entry was posted in Uncategorized on 28th August 2014 by glyncc. Would you leave your door or safe open 24/7 so why allow BYOD? First of all what is BYOD? Obviously we have run out of three letter abbreviations so we are rapidly moving on to four or more. BYOD is simply Bring Your Own Device, this is anything you take in to work, namely Laptops Tablets and Smartphones and other electronic devices that can communicate with your infra structure. You may not think that anyone brings in their own device but neary everone has a smartphone and some companies allow or even encourage employees to buy their own tablet or laptop and use them for work and play. What are the risks? Is it an accident waiting to happen? If you are diligent you will have a secure building, fire policy, alarms, CCTV, Firewalls on your router, secure network, signing in and out book, Health and Safety policy but anyone who comes in with a device is inside your “Fortress”, not outside trying to come in. From an IT point of view we have complex passwords, firewalls, routing tables. These are to make sure that no one can access your data by hacking in, well clearly in many cases of the big banks and stores it fails but at least they try, so they wont get a £500,000 fine for breaking the data protection laws, how about your company. You should have a BYOD policy to protect you and your company, its usually like wills, backups and intruder alarms, they all become important after the event. Here is a list of the top eleven threats. Threats to the enterprise posed by an employee-owned mobile device can be as complex as a sophisticated malware attack designed to snoop on an employee’s browsing activity or as simple as a lost phone in a taxi. The threats are forcing security teams to introduce new policies to reduce the risk. Enforcing them without impacting productivity is a balancing act. Experts say the first step is to understand the perceived risks and weigh them against the company’s security posture. Jailbreaking removes the limitations imposed by the device maker, often eliminating restrictions designed to improve security of the devices. Rooting gives the device owner administrator-level permissions, enabling them to install and run apps that could be potentially malicious in nature. Often the employee who demands the latest and best technology may also be technical enough to jailbreak or root their device. Easily available Tools have helped make this easier and now it can be done with a few mouse clicks. 10. The Greeks are inside! Most devices are configured to find and try to connect to any wireless networking signal to access the Internet. While most businesses provide secure access points for guests, open wireless points can put device owners at risk of man-in-the-middle attacks and other threats that enable an attacker to snoop on their activity. If the device owner fails to implement a PIN code to lock the device, anything that falls into the wrong hands can give an unauthorised person unlimited access to e-mail and data until the device is reported lost and the data is wiped. Some organisations are implementing policies to make users sign in every time they access their e-mail using their device. Many easily available add-ons and applications collect as much information as possible about the user on the device in an effort to sell the data to advertising networks. A mobile application is considered Adware or Spyware by security vendors when it collects data without requesting the owner’s permission. Some apps also install aggressive ad-driven search engines on the device to send users to specific advertiser web sites. Google, Apple and Microsoft have restrictions that force mobile application makers to request permission to access resources, such as the camera and contacts but most users usually fail to read the small print and grant permission during the install process. The wrong permissions could expose contacts, e-mail addresses and device location data to unscrupulous people. Dropbox and other remote storage services known as “the cloud” but in reality it’s a fancy name for just using the Internet to store data elsewhere which can lead to data leakage. These are used to store data as a backup or to share and if you fail to put restrictions on sensitive data or fail to have an enforcement mechanism restricting the use of mobile cloud storage apps there could be a problem. If a company doesn’t provide an approved storage solution, technically savvy users might bypass any security controls altogether. In addition to Dropbox, Google, Apple and Microsoft have cloud-based storage capabilities aimed at consumers and anyone can stick a server on the network and sell space without any regulations or checks. There is a steady increase in malware targeting mobile. The bulk of the threat is made up of SMS text messaging Trojans targeted at consumers, but enterprises are not immune. Security firm Kaspersky Lab recently identified Red October, a targeted attack campaign that had a mobile malware component. Zeus and SpyEye are banking Trojans that attempt to take advantage of a victim’s mobile device. Lost or stolen devices are the biggest risk if you allow employees to connect their personally owned device to the company network. It is possible to implement ways to remotely wipe any corporate data, such as e-mail and contacts, from a lost device. The response from employees who don’t want to give their employer unrestricted access to their device has prompted companies to take a closer look at containerisation. By containerising business data on the device, IT teams can have the ability to selectively wipe corporate data if the device is lost or stolen. To ensure that you cover all these points it is necessary to have a BYOD policy in place and ask every employee, as nearly everyone will want to use your network, to agree and sign. Most wireless routers will allow users to connect using their device and you hand out the access rights when you give them the password. You do have password protected wireless don’t you? The safe way is to grant them access after they have signed the policy and note their devices code so they can’t give it to anyone else. Its like everything in your business, you need to stay in control otherwise others will control you. Make sure your Internet storage is necessary, safe and secure. We can write and help you implement a BYOD policy which covers most of the aspects in this listicle – which is a new word in the Oxford English dictionary, an article based on a list. This entry was posted in Uncategorized on 26th August 2014 by glyncc. 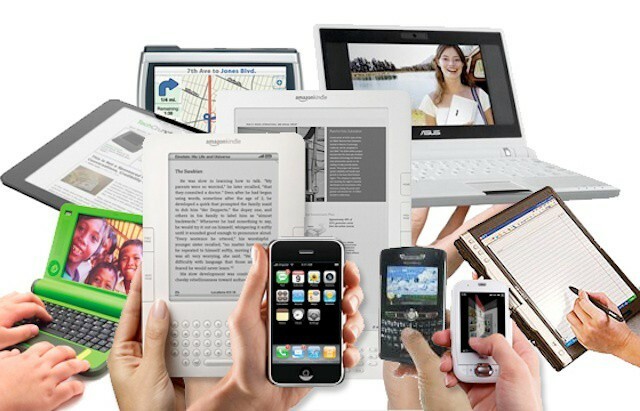 To BYOD, or not to BYOD, that is the question – maybe. Of course you know the quote by William Shakespeare from Hamlet but what’s it got to do with BYOD? Just read on and you will find out. Hamlet wonders whether he should simply endure the hardships of the situation he is in, or else take aggressive action to combat the problems. I think we would place the same interpretation on this quotation today, you probably do have BYOD in use but who is in control, you or events? Actually it’s not the question as virtually everyone does bring a device. Its a question of what you let them do with it. There are several concerns with BYOD usage. The main issue for many businesses is control. Since it is the employee’s device, they have complete control over the apps and data they access, not you or the company. This lack of control correlates with a second issue when it comes to letting employees use their own devices: security. Since there is no control over what employees do with their devices, they run the risk of downloading apps and data that are not secure and could pose a threat to your company technology. Many employees are not aware of what apps could present a risk or even aware of what constitutes a risk. Another major issue in terms of BYOD is deciding what constitutes acceptable use. With company-owned devices, what is and is not acceptable is pretty easy to define. It is harder to define those uses when the employee owns the device and uses it for both business and personal reasons. Many companies are allowing their employees to use their own devices for work-related purposes because it offers their company several huge benefits that may outweigh the negatives. One of the main advantages of allowing employees to bring their own device is that it often saves the business money. When employees use their own mobile or computer, they pay for it themselves, which can save companies as much as £40/month per employee. You can always just reduce your bill where you pay £15 a month to cover work related tasks. According to an eWeek.com article, increased employee productivity and efficiency is another major benefit of BYOD. 64% of IT managers surveyed said they felt allowing employees to use their own devices would increase productivity and efficiency and 42% of employees enrolled in BYOD programs said that they saw a rise in both areas. Evaluate: Consider whether or not the benefits outweigh the negatives, or vice versa. Educate employees: Make sure your employees are aware of the risks of using their own devices for work purposes. If employees are educated about the risks and potential errors, they are less likely to make them. Create a strategy: According to Padmasree Warrior, CTO of Cisco, organizations need to create a mobile strategy and should especially consider potential security issues. Communicate: You need to be clear about expectations and rules for when employees use their own devices. Once you have a policy for use in place, communicate that with your employees so they know what to expect. Cloud computing is one of the major contributing factors to the growth of the BYOD trend. When you sign your business up for cloud services, you can “anywhere enable” your data and applications so that employees can access them on their own devices. This entry was posted in Uncategorized on 21st August 2014 by glyncc. Why there is a backslash, I bet you haven’t even noticed or even care! There is something that we have all become familiar with and it wasn’t until I started swapping between using UNIX and MSDos that I even noticed. Look at the URL in your internet browser. Notice its http://www.cmx.co.uk/blog/. The slashes lean forward like this / whereas if you look at a Windows location then its C:\windows\system32\. The \ doesn’t even exist on golfball or other typewriters – Do you remember them? If you are a Unix geek like we are then you know the answer, maybe you don’t care but for the rest of you here is the answer. The quick one is \ is for MsDos which is behind Windows in all it’s guises. The other is for UNIX which runs many things including the internet, TV’s, mobile phones, routers and so much more, it’s amazing. (read our post a few weeks ago to find out more). It all stems from Microsoft’s relationship with IBM. When MSDos Version 1 came out there were only floppy disks A & B. Many of the DOS utilities were written by IBM, and they used the “/” character as the “switch” character. The “switch” character is the extra character that tells the utility which options to use. Although on UNIX it was the “-” character but most early DEC operating systems used “/”. As several of the original MS-DOS developers were old DEC developers it’s possible that they carried it forward. The fact that the “/” character conflicted with the path character of other relatively popular operating systems weren’t particularly relevant to the original developers – because DOS didn’t support directories, just files in a single root directory. Then along came DOS 2.0 tied to the PC/XT, whose major feature was a 10 Mb hard disk. IBM asked the Microsoft to add support for hard disks, and the MS-DOS developers took this as an opportunity to add support for modern file Application Programming Interface’s (API) – they added a whole series of handle based APIs to the system (DOS 1.0 relied on an application controlled structure called an File Control Block (FCB). They also had to add support for hierarchical paths or directories as we know them. Now historically there have been a number of different mechanisms for providing hierarchical paths. UNIX defines hierarchical paths with a simple hierarchy rooted at “/” – in UNIX naming hierarchy, there’s no way of differentiating between devices, files and directories, etc. (This isn’t bad when you get used to it by the way, its just how it works. For MS-DOS 2.0, the designers of DOS chose a hybrid version – they already had support for drive letters from DOS 1.0, so they needed to continue using that. And they chose to use the UNIX style method of specifying a hierarchy – instead of calling the directory out in the filename, they simply made the directory and filename indistinguishable parts of the path. But there was a problem. They couldn’t use the UNIX form of path separator of “/”, because the “/” was being used for the switch character. So what were they to do? They could have used the “.” character like the DEC machines, but the “.” character was being used to differentiate between file and extension. So they chose the next best thing – the “\” character, which was visually similar to the “/” character. And that’s how the “\” character was chosen. Here’s a little known secret about MS-DOS. The DOS developers weren’t particularly happy about this state of affairs – heck, they all used XENIX (Microsoft’s version of UNIX) machines for e-mail and stuff, so they were familiar with the UNIX command semantics. So they coded the OS to accept either “/” or “\” character as the path character (this continues today, – try typing “notepad c:/boot.ini” on an XP machine. They then went one step further, they added an undocumented system call to change the switch character and updated the utilities to respect this flag. Then they went one stage further and finished the scenario; they added a config.sys option, SWITCHAR= that would let you set the switch character to “-“. Which flipped MS-DOS into a UNIX style system where command lines used “-switch”, and paths were / delimited. I don’t know the fate of the switchar API, it’s been long gone for many years now. So that’s why the path character is “\”. It’s because “/” was taken. Its also why when you use the internet where virtually everything is run by UNIX the / appears but your computer thinks of it as \. This entry was posted in Uncategorized on 19th August 2014 by glyncc. There’s a connection between the Space Shuttle and a Roman horse’s backside? When we see a Space Shuttle sitting on its launch pad, there are two big booster rockets attached to the sides of the main fuel tank. These are solid rocket boosters, or SRBs. The SRBs are made by Thiokol at their factory in Utah. The engineers who designed the SRBs might have preferred to make them a bit fatter, but the SRBs had to be shipped by train from the factory to the launch site. The railroad line from the factory had to run through a tunnel in the mountains. The SRBs had to fit through that tunnel. The tunnel is slightly wider than the railroad track. The railroad track gauge (width between the two rails) is 4 feet, 8.5 inches. That’s an exceedingly odd number. Why was that gauge used? The moral is that something is accepted as true because it’s plausible, well at cmx we never take anything at face value we investigate and try everything first. You may be tempted to just use Microsoft servers and Office 365 but we have solutions that work the same and will save you £8,000 and £600 respectively. So if you want to talk to us and find answers to the questions we ask then email info@cmx.co.uk or pick up the phone 24/7 and talk to a human in either Colchester or Ipswich (We don’t do machine answering). This entry was posted in Uncategorized on 14th August 2014 by glyncc. Getting a man on the Moon was one of the 20th century’s crowning achievements and a feat that hasn’t been matched by any government, let alone a private company. So what sort of heroes are going to show us they’ve got the right stuff this time? Well, none at all. The unmanned craft will simply deliver powdered pop for future human space visitors to drink… along with a little extra – a huge container of children’s dreams. Shaped like a drinks can, the “Lunar Dream Capsule” is the brainchild of a Japanese drinks firm called Pocari Sweat. The firm visited high schools to collect the kids’ dreams, which isn’t quite as creepy as it sounds. These are sketched on a bit of paper and loaded into a huge titanium Pocari Sweat drinks can, along with a packet of the powder used to make the popular beverage. According to the information, this is meant to symbolise “our precious water” and prove that “dream [sic] is always close to our hands”. The marketeers said they hope that one day “youths interested in space will live out their dreams” and mix the powder with lunar water to create Pocari Sweat itself. During October next year, the huge drinks can will begin its 380,000km journey to the moon. In a statement, Otsuka Pharmaceutical Co, Ltd, owner of the sweaty brand, said: “When the Lunar Project succeeds, Pocari Sweat becomes the first ever beverage to arrive at the surface of the moon. Move forward with dreams: Pocari Sweat will always support your dreams as a beverage close to you. This entry was posted in Uncategorized on 12th August 2014 by glyncc. Are you doing the same as Lloyds Bank and RBS? Royal Bank of Scotland boss Ross McEwan admitted that it had failed to invest properly in systems for decades as he apologised for an embarrassing IT failure on the busiest online shopping day of the year in 2013. This breakdown may come as a shock to RBS customers and instil a sense of smugness elsewhere but be very, very, careful, ask any IT consultant if this is surprising news and not only will they not be surprised they will be shocked it doesn’t happen more often. We are seeing plenty of bank and big business breakdown and it’s all because of undespending. There used to be an adage that “no-one ever got fired for buying IBM”. They were known for quality of products and service and you paid what they asked, without query. Now its a case of here is your budget, now get the best you can, and off the uninformed employee sets off on the impossible quest. When was the last time a Director thought “I want that MERC outside my office but I will go for a lower model because I don’t need everything that it offers and I will save money, I will go for Ford Focus Cmax instead? There seems to be two misconceptions. 1. It is always more expensive than it should be and 2. They are trying to make as much out of me as they can. Let me blow the myths away for us, and our fellow consultants (the good ones not the ones who are guessing). It will be the price it is, you get what you pay for, Everyone is trying to make as much as they can to survive and thrive, but not at your expense. If the Answer is £5000 why should I say £7000? I am less likely to get the business. However if I say £3000 then that, in your mind will be too much. Imagine you have had a heart attack and the Consultant tells you its going to cost £5000 to make you better, would you say “You’re wrong, I only want to spend £3,000, give me a cheaper part and operation” . Of course you would, you don’t value yourself do you? Wrong, you’d soon find the extra. So why jeopardise your business health? Find someone you can trust and take their advice, that’s the hard part isn’t it – trust? Do your clients trust you? or will they be like RBS customers and go elsewhere when the service drops because the IT breaks, never mind you did buy the MERC because you needed it didn’t you? This entry was posted in Uncategorized on 7th August 2014 by glyncc. I dont want to pay Microsoft an extra £8,000 for a server – but what is UNIX? Every one assumes that everything computing is either Apple or Microsoft and if it’s a server then it’s got to be Microsoft, well sorry to disappoint you but the big computer systems run on a product called UNIX, of which variants can also be used on other systems too, such as a server, a television, the Android phone in your pocket and all Apple products. This blog is to explain why UNIX might be a better solution for you than having a Microsoft server, because it’s cheaper, its more reliable and much more efficient at networking. Why isn’t everyone selling it? Well that’s simple it takes a special technical IT person to install and configure it, an IT technician who actually understands computing as opposed to someone who has been on a one day course or read “Networking for dummies”. If you want to want to know it’s history and why it’s sometimes the best choice for smaller companies then read on, otherwise just re-read the second paragraph. UNIX is an operating system like Windows and Windows server. It easily predates Microsoft by decades and comes with a totally different history. Microsoft was designed as a single computer operating system and then added networking later, whereas UNIX was designed from the beginning as a multi-user, shared, networked operating environment. There are many variants of UNIX such as AIX, Solaris, Xenix, Posix, Linux, Os X, Chrome and Android but they all started from the same source and we use the UNIX as a generic explanation. In the early ’60’s AT&T and Bell labs developed the original UNIX. AT&T tried to commercialise it by licensing UNIX to third-party vendors, leading to a variety of both academic and commercial variants. Eventually the product became an open source product and the Open Group decides who can call their system UNIX. There are many UNIX-like systems but the group disapproves of the term being used by them. There are many versions now available but we have chosen to use the BSD distribution which originated in the University of California, Berkeley and which is now the most widely used derivation. As mentioned earlier UNIX was developed as a multi-user networking product. Because the typical computer in the 1960’s was less powerful than a modern digital watch it had to be small to run. Now computers are more powerful it is ultra efficient in what it does. Windows was designed to run on bigger systems and networking was added making it large and cumbersome in comparison. UNIX does it in a small space but Windows needs massive computing power and RAM to do the same task. Why UNIX for Small Business? UNIX needs less to do more. So if you need raw networking power such as running a Sage system then UNIX will give it to you on a smaller machine. No matter how large and powerful your system is Windows will always work slower in supplying data down a network. It means that a simple data server can cost £££’s less than a Windows server. Why supply Windows Server then? Microsoft has several server packages apart from just a file server such as SQL, Exchange and other more specialised packages. This makes it an easy recommendation, sell, buy and install but it might be the easiest but not necessarily the right choice. There are other programs that the vendor says will only work with Microsoft because they don’t want to try it on other platforms, after all they are selling software and not buying hardware. So sometimes Microsoft is the only choice. The difference is we sell both Microsoft and UNIX , we know the difference and we know which is the right solution for you, After all we will be the ones looking after it and how many sales people can say that? What is the difference to me then? UNIX servers don’t get viruses or hang like Windows. UNIX servers usually cost 50-70% less than Microsoft servers for the same performance. Apple, Amazon, IBM, Google, Android, Panasonic and virtually all of the Internet and big businesses who use IBM, Sun, HPUX, the list is endless really. Apart from the washing up, its not very good at GUI’s, that’s graphiocal interfaces such as the desktop screen you see when you use icons, there are versions of it but it uses a large amount of processing power, Aple have the best implementation but you can get at the nuts and bolts behind Apple to run your own programs. If its so good why isn’t everybody selling it instead of Microsoft Server? So its too technical for most computer companies to install and setup. Once its done though, it just works, like an Apple product or Panasonic TV. The hard / clever bit is installing it and setting it up. It takes years of experience, training and knowledge, we have loads of that but most companies want a quick easy install using cheap labour. We want a reliable, value for money install instead. I was talking to a computer company who is bigger than us, we have 7 staff and they have 17. They target companies with 100 + users whereas we target SME 1 to 60 users. Different market and Microsoft is an easier sell and install for them. They will never invest in UNIX expertise. I suspect if their target market was 1000+ users then they would. This entry was posted in Uncategorized on 5th August 2014 by glyncc.